‘The most famous game of all time’ was the heading used by Frank Marshall on page 54 of Comparative Chess (Philadelphia, 1932) to describe Morphy against the Duke and Count, Paris, 1858 (1 e4 e5 2 Nf3 d6 3 d4 Bg4 4 dxe5 Bxf3 5 Qxf3 dxe5 6 Bc4 Nf6 7 Qb3 Qe7 8 Nc3 c6 9 Bg5 b5 10 Nxb5 cxb5 11 Bxb5+ Nbd7 12 O-O-O Rd8 13 Rxd7 Rxd7 14 Rd1 Qe6 15 Bxd7+ Nxd7 16 Qb8+ Nxb8 17 Rd8 mate). A point on which sources vary is the opera that was being performed, i.e. whether it was The Barber of Seville or Norma. This question was raised in C.N. 120, and in C.N. 159 W.H. Cozens responded: ‘Who cares? When Michelangelo was painting the ceiling of the Sistine Chapel, who cares what chant was heard from below?’ Even so, it is a matter which has interested other chess writers (e.g. D.J. Morgan on page 362 of the November 1954 BCM and C.J.S. Purdy on page 276 of the December 1955 Chess World). Whether anybody can take this beyond Fine’s ‘The story goes’ stage remains to be seen. ‘The Duke of Brunswick, with whom Morphy first dined on 19 September, was a confirmed chessplayer, hardly to be seen otherwise than at chess. Edge says they were frequent visitors to the Duke’s box at the Italian Opera and even there the Duke played chess. On their first visit in October they played chess throughout the entire performance of Norma. Edge mentions Morphy’s discomfiture when he was the Duke’s guest, since he was obliged to sit with his back to the stage, while facing the Duke and Count Isouard consulting against him. 23 Rxe6+ (‘Very well played. 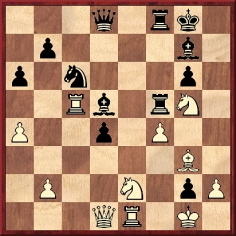 From this move onwards White plays his game remarkably.’ – Rosenthal.) 23…Kxe6 24 Re1+ Kf5 25 Qf3+ Kg5 26 Re6 Qc1+ 27 Kg2 g6 28 Qf6+ Kh6 29 Qh4+ Kg7 30 Re7+ Kg8 31 Qf6 (Forcing a clear-cut mate, although 31 Qe4 Kf8 32 Rd7 is faster.) 31…Qc6+ 32 Kh3 Qc8+ 33 g4 Qf8 34 Qe6+ Resigns. Source: La Stratégie, 15 April 1870, pages 93-94. 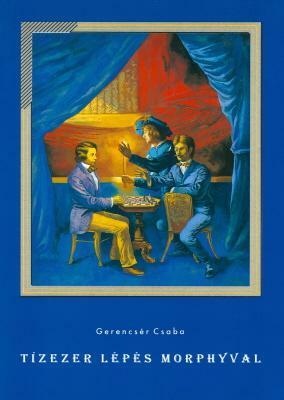 On page 189 of his book In the Dark (Coraopolis, 1985) the ever-innovative G. Koltanowski referred to ‘the famous game Morphy played at the Opéra de Paris against the Duke of Brunswick and the Count de Mongrédien, in consultation’. Christian Sánchez (Rosario, Argentina) has consulted the fortnightly magazine L’Univers Musical of October and November 1858. He reports that although Morphy’s name did not appear, the 16 October and 1 November numbers mentioned that the October performances at the Théâtre-Italien included Norma, while the 15 November issue stated that The Barber of Seville had been performed that month. This schedule is in line with the information quoted from Lawson’s book above. Source: Chess Strategy by Edward Lasker (London, 1915), page 26. 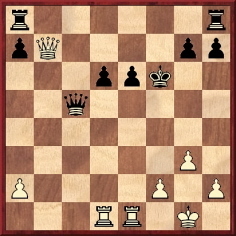 21 Re1 Rxf6 22 Qg8+ Nxg8 23 Re8 mate. Source: Brooklyn Chess Chronicle, 15 April 1887, page 109. 30…d3 31 Qxd3 Qxg5 32 Rd1 Nb4 33 Qd2 Qg4 34 Re1 Re8 35 Qxb4 Rxe2 36 Rxd5 Rxd5 37 Qc4 Bd4+ 38 Bf2 Bxf2 mate. Source: Chess Monthly, January 1858, pages 19-20. C.N. 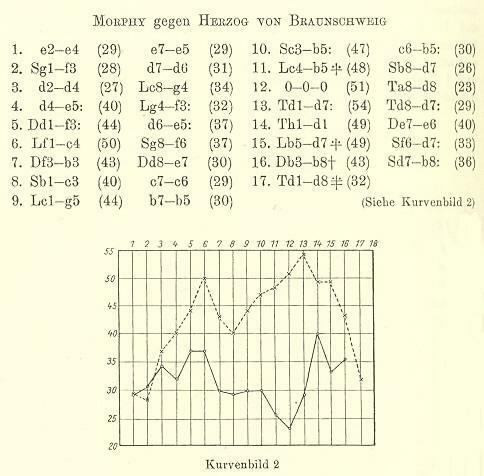 4931 gave a chart, from page 130 of the May 1935 Deutsche Schachzeitung, depicting the Morphy game in terms of the units’ mobility after each move. 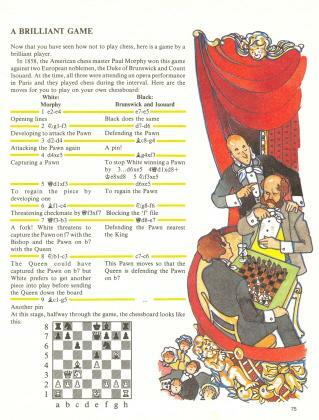 Page 75 of Purnell’s Chess for Children by Martin J. Richardson (Bristol, 1984). Fabrizio Zavatarelli (Milan, Italy) notes that the information quoted above from David Lawson’s book (‘On 2 November they heard The Barber of Seville, during which Morphy played his most famous game, the Duke again consulting with Count Isouard.’) does not match the announcements of opera performances published in the Parisian newspaper La Presse. Les Noces de Figaro at the Théâtre Lyrique. La Perle du Brésil at the Théâtre Lyrique. The Opéra was not listed as a venue in the 3 November newspaper. Does a solid contemporary source exist to support the date of the Morphy game put forward by Lawson? The listings in La Presse suggest that there were no theatrical performances at all on 2 November, a day of prayer in the Roman Catholic Church (Le jour des Morts/All Souls’ Day). Unusual misspellings include ‘Isnouards’, which occurs twice on page 66 of Les échecs par la joie by Aristide Gromer (Brussels, 1939). 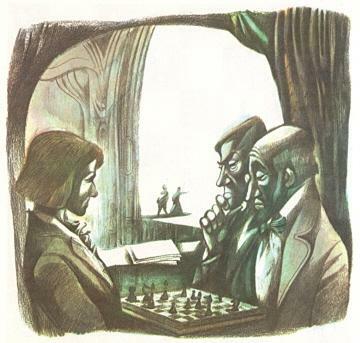 On page 7 of the December 2013 CHESS Nigel Short mentioned the Morphy game as his favourite of all time (‘First loves are always the deepest’). In the first volume of Napier’s Amenities and Background of Chess-Play (Brooklyn, 1934) it was game 68 and was described as ‘The most celebrated game’. Lasker’s butcher/artist remark has often been quoted sourcelessly (e.g. in P.W. 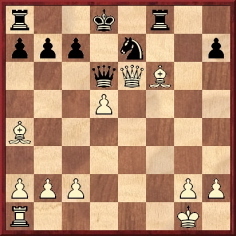 Sergeant’s first monograph on Morphy) with reference to 8 Bxf7+, and not also 8 Qxb7. Latest update: 1 July 2017.